The chemical industry is diverse industry with multiple products and numerous processes for their manufacturing. The first pilot installation of ARUN®160 solar boiler/concentrated solar thermal system (CST) in the chemical industry was carried out at TheHeavy Water Board in Kota. 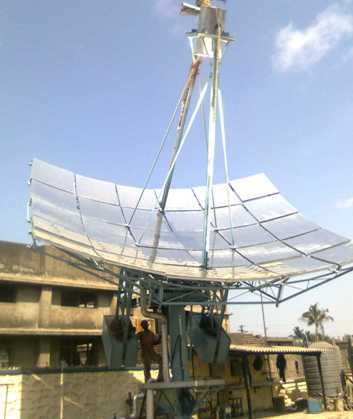 The heat generated through ARUN solar thermal system is utilized for effluent evaporation application. 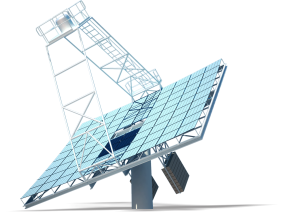 The four dish ARUN®160 solar boiler / concentrated solar thermal generating system generates steam at 5 bar pressure at a 150 °C. The solar steam is directly fed to the effluent tanks to evaporate the water from the effluents. The water is circulated through the receiver coils which are placed at the focus of dishes transferring the thermal energy from the sun to the circulating water inside the receiver of the solar thermal dish. The water gets heated by continuous circulation and a certain portion gets converted into steam. The water and steam mixture is then passed to steam separator tank where dry saturated steam is separated from the water. This dry saturated steam at 5 bar, 150°C is directly mixed with the effluent tanks to evaporate the water. The return condensate at 70 °C is collected and circulated back into the circuit.